If you're planning a trip to Jupiter's moon Europa, be prepared for a rough landing. In a study released Monday, scientists say they've found evidence of huge, jagged "ice spikes," some 50 feet tall, on the moon's surface. They spikes would "pose a hazard to any future space mission landing on the moon," according to the study. The spikes could be similar to "penitentes" down here on Earth, like those found in the higher elevations of South America. "In extreme cold and dry conditions on Earth, such as those encountered in the Andes, the sun's rays can cause parts of the ice and snow to undergo sublimation – becoming water vapor without melting first," the study said. This process leaves behind distinctive, blade-like formations called penitentes. Although scientists have not seen the spikes there, a similar process likely occurs on Europa, the study suggests. Evidence of penitentes has also been seen on Pluto, suggesting that such jagged terrains may be common on icy worlds – including Europa. On Europa, these spikes could be as close as about 20 feet apart, creating a "treacherous terrain" for potential landing craft. 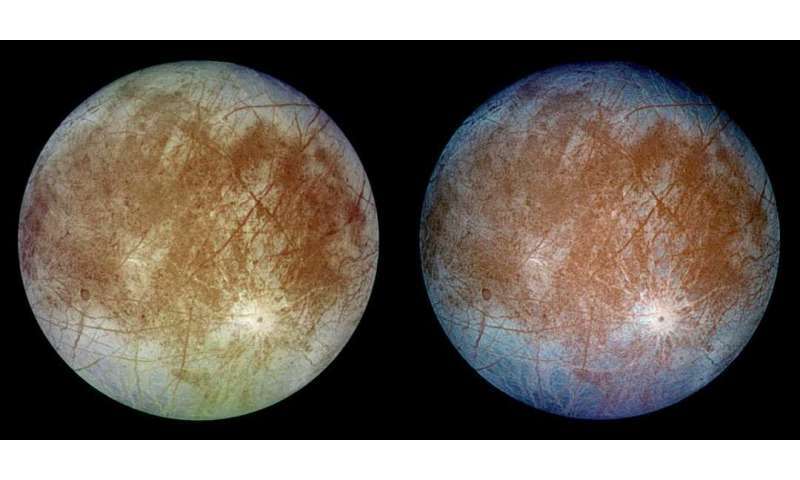 Due in part to its salt water ocean, Europa is one of the more promising candidates for extraterrestrial life in our solar system, NASA said, so the moon has been targeted as destination for a future space mission. "Beneath the icy surface of Europa is perhaps the most promising place to look for present-day environments suitable for life," NASA said. Scheduled to launch in the 2020s, the Europa Clipper mission would arrive at Jupiter several years later and try to see whether the icy moon could harbor conditions suitable for life. Led by Daniel Hobley, a Cardiff University scientist, Monday's study was published in the peer-reviewed British journal Nature Geoscience. Snow-cups in the Sierras, miserable to walk across. Oh yeah, not fond memories there. How about attempting to drive on black ice? A big problem with water ice and snow is the lack of internal supporting structure. The word treacherous is the perfect description of those environments. The antenna would sit on the surface, connected to the RTG by the cable. As it melts its way into the planet the cable would spool off the back of the RTG, becoming embedded in the ice as it froze behind the advancing probe. Pockets of water could be explored by the swimmer as they are encountered, returning before the ice in the melt zone refroze. When it finally reached the bottom of the surface layer of ice the swimmer could roam freely, returning to the probe to upload any observations and recharge. Oh, well, Congress would never pay for it, guess I'll have to go buy a superlotto ticket. C, I do not agree with your proposal. But here is a suggestion. Lose the antenna system. The ice is many kilometers deep. Have you figured the weight of the antenna system or the cost to launch it? Replace with small, isotope powered, relay buoys. Drop one off every kilometer or ten to relay data from the sinking probe to a surface station. Able to broadcast to a geostationary satellite with the power to send comm to Earth orbit. Now, it is my unverified opinion under the ice will be a lifeless sterile ocean. Since it is possible, if improbable, that I am wrong? Sending a descending probe to Europa, directly from Earth? Would be a catastrophe for those poor, innocent alien microbugs. Who will fail to appreciate you planting a flag of glory on their dance floor. Since there is no reliable way to prevent contamination of an Earth manufactured probe. Instead of loto tickets. Spend your money on crowdsourcing an orbital automated factory to build your probe. rrwillsj i'm pretty sure the orbital automated factory your referring to would have to be launched from the earth into space, meaning you haven't exactly made a fool proof way to not contaminated your probe. Reasonably correct, if it was launched assembled. Providing interior hiding places. Instead, launch it disassembled to a geo-synch orbit. That would mostly position it outside the Van Allen Belt. Assemble by remote control. With all the pieces exposed to remorseless radiation, especially ultra-violet. There is no evidence that even the toughest Earth-life can survive in that environment, deprived of protective atmosphere & water. A three or even a two nines certainty should be acceptable. Consider that the probe will continue to be exposed to this merciless environment for the duration of the trip? All the way from Earth orbit to Europa. Once within the orbit of Callisto, until it actually reaches Europa. The probe will be constantly buffeted by the very energetic radiation belts produced by Dynamo Jupiter. I think by touchdown? We can be confident to four nines, that there is no Earth-life being delivered to contaminate a possibly pristine world. Aren't portions of satellites/probes/spacecraft designed to be heavily shield from radiation, like in the case of Juno, for example? Also keep in mind that every single portion of the spacecraft would need to be manufactured in space. That would be quite an undertaking.